For the first time in decades, more manufacturing jobs are returning to the United States than are leaving. That’s according to the latest report from the Reshoring Initiative, a consultancy based in Kildeer, IL, that tracks reshoring trends. 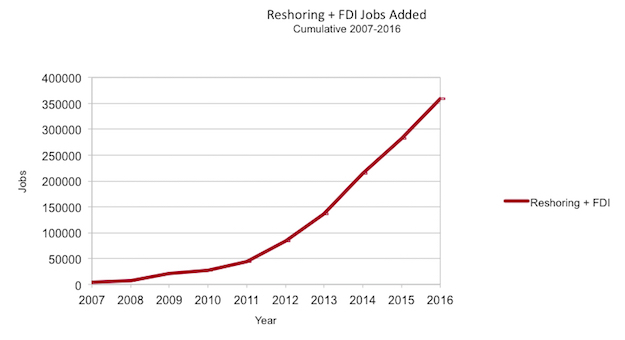 Combined reshoring and foreign direct investment (FDI) grew by more than 10% in 2016, adding 77,000 jobs (tying the 2014 record) and exceeding the rate of offshoring by about 27,000 jobs. The 2016 results bring the total number of manufacturing jobs brought back since the manufacturing employment low point of February 2010 to more than 338,000. The Reshoring Initiative’s 2016 Reshoring Report contains data on U.S. reshoring and FDI by companies that have reshored U.S. production or brought back sourcing from offshore locations. The report includes cumulative data from 2010 through 2016, as well as highlights from the first quarter of 2017. In comparison with 2000 to 2003, when the United States had a net loss of about 220,000 manufacturing jobs offshored each year, 2016 achieved a net gain of 27,000 jobs. The tide has turned. The numbers demonstrate that reshoring and FDI are important contributing factors to the country’s rebounding manufacturing sector. The overall trend was up from 2015 due to anticipation of potential policy changes that will make the United States more competitive, continued rising wages overseas and increased use of total cost of ownership for sourcing decisions. “We publish this data annually to show companies that their peers are successfully reshoring and that they should reevaluate their sourcing and siting decisions,” said Moser. “With three to four million manufacturing jobs still offshore, as measured by our $50 billion/year trade deficit, there is potential for much more growth. We call on the administration and Congress to enact policy changes to make the United States competitive again. Our Competitiveness Toolkit is available for them to quantify the impact of policy alternatives, including a stronger skilled workforce, lower corporate taxes and regulations and a lower U.S. dollar,” said Moser. Proximity to customers was the leading factor in 2016, followed by government incentives, skilled workforce availability and ecosystem synergies. The Southeast and Texas remain the top regions for reshoring and FDI, with the Midwest in second place because of its strong industrial base. Transportation equipment remained the strongest industry, accounting for nearly 40% of total jobs returned. Plastics/rubber and furniture saw the largest increases in industry ranking. FDI has remained stronger than reshoring. Both trends are based on the logic of producing in the local market, otherwise known as localization. Preliminary 2017 data trends are looking to be at least as good as 2016.more than 4,000 published articles, privately submitted reshoring case studies and privately documented cases. The report provides data and analysis in 10 different categories, ranging from the number of manufacturing jobs gained and reasons cited for reshoring to a breakdown of data by industry, country, region and state. It also includes data on the nearshoring trend (Canada and Mexico).